The Senate has approved Heather Wilson, president of the South Dakota School of Mines and Technology, to assume the U.S Air Force‘s top civilian position through a 76-22 vote. 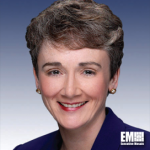 She will be sworn in as Air Force secretary within a week and replace Lisa Disbrow, who headed the service branch on an acting basis since January 20, the Air Force said Monday. “I look forward to getting to work, focusing on readiness, modernization, development of leaders and research for the future,” said Wilson. Wilson served as an Air Force officer during the Cold War and worked for the National Security Council Staff during the George H.W. Bush administration. She also held the adviser role at multiple scientific and defense organizations before and after she served in Congress for more than 10 years. Between 1998 and 2009, she served on different House committees such as the lower chamber’s Armed Services, Intelligence and Energy and Commerce committees.